Dysaphis plantaginea induce yellowish crumpled leaf galls on apple in spring (see first picture below). The globe-shaped adult apterae are dull pinkish to slate grey or purplish grey with a greyish-white wax bloom (see second picture below). The antennae of apterae are at least as long as distance from the frons to the base of the siphunculi. The siphunculi of Dysaphis plantaginea are quite long compared to other Dysaphis species, blackish brown and tapered with flanged tips. The cauda is dark, short and triangular. The Dysaphis plantaginea aptera body length is 2.1-2.6 mm. The clarified slide mounts below are of adult viviparous female Dysaphis plantaginea (on secondary host) : wingless, and winged. Note the aptera (unlike the alate) is has no sclerotization on the abdominal tergites anterior to the siphunculi. The overwintering eggs laid on apple hatch in spring, and the aphids then gall the leaves of apple. Forrest & Dixon (1975) investigated the induction of galls by the related aphids Dysaphis plantaginea and Dysaphis devecta. Dysaphis plantaginea causes the leaf to roll longitudinally (see picture below), whereas the related Dysaphis devecta causes the leaves of its host plant to roll laterally. Both species of aphid are phloem feeders. Dysaphis devecta prefers to feed on the smaller veins in the lamina whereas Dysaphis plantaginea chooses the midrib. However, groups of Dysaphis devecta or Dysaphis plantaginea confined to the stem of an apple seedling induced young leaves several centimetres away to develop leaf rolls characteristic of each species. 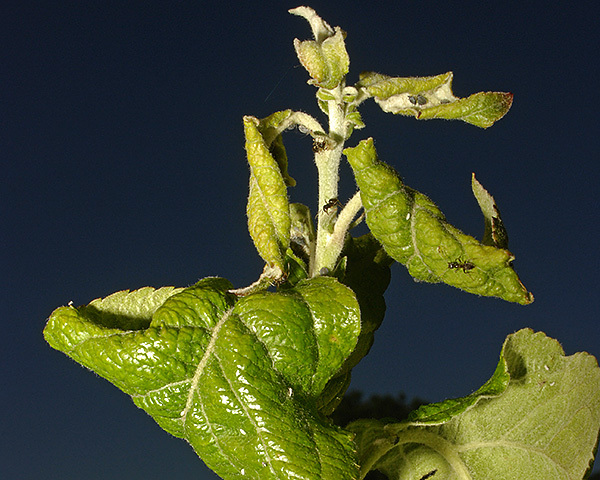 A single larva of Dysaphis devecta or Dysaphis plantaginea can induce a leaf-roll or a stem-bend on an apple seedling within 24 h. It is suggested that characteristic abnormalities in leaves attacked by Dysaphis devecta and Dysaphis plantaginea are caused by specific substances in the saliva of each aphid. The rosy apple aphid spends 2-5 generations on its primary host - apple - before producing winged forms which migrate to its summer host, plantain (Plantago) spp., especially ribwort plantain (Plantago lanceolata) and broad-leaved plantain (Plantago major) (see picture below). On the summer host a yellow-green colour morph is produced and 3-8 generations are produced before migrants return to apple in Autumn. Blommers et al. 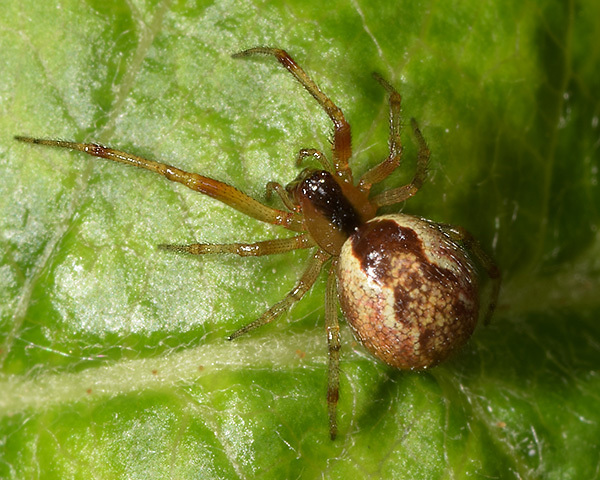 (2004) studied the biology of Dysaphis plantaginea on its summer host in Europe and Cockfield et al (2012) did the same in the USA. In the USA colonies were scarce on Plantago with only 11-19% of plantain plants bearing colonies. Colonies were generally small, fewer than 25 individuals. Possible causes of low populations were thought to be biological control, unfavourable climatic conditions and summer mowing. An alternative summer host was not considered likely. We have been unsuccessful at finding Dysaphis plantaginea on its summer host in Britain, suggesting that colonies on the secondary host are also scarce here, despite their abundance on apple. On returning to apple in autumn, our experience is that Dysaphis plantaginea tends not to gall the leaves, but instead lives usually in low numbers on the senescing leaves. The picture below shows why Dysaphis plantaginea is called the rosy apple aphid. Having said that, the colour is rather variable from dull pink to purplish grey, with variable amounts of greyish-white wax bloom. We have on one occasion found what appeared to be a green form (see picture below) - this could have been one of the other Dysaphis which occurs on apple, but the gall was greenish-yellow which is characteristic for Dysaphis plantaginea. Dysaphis plantaginea is nearly always attended by ants, usually Lasius niger. Stewart-Jones et al. (2007) conducted an ant exclusion study in two orchards within the U.K. Overall, the exclusion of ants reduced the growth and eventual size of Dysaphis plantaginea populations. On trees accessed by ants, greater numbers of natural enemies were recorded, presumably because aphid populations were often greater on such trees. However, this increased natural enemy presence was diluted by the larger aphid populations such that individual aphids on ant-attended trees were subjected to a lower natural enemy pressure compared with those on ant-excluded trees. At harvest, apple trees that had been accessed by ants bore a greater proportion of apples damaged by Dysaphis plantaginea. The authors suggested that ant manipulation, whether physically or by semiochemicals that disrupt the relationship, should be considered as a more prominent component in the development of future integrated pest management strategies. Miñarro et al. (2010) tested the hypothesis that ants play a role in structuring the aphid community on apple comprising Dysaphis plantaginea, Aphis pomi, Aphis spiraecola and Eriosoma lanigerum. Ants were found to establish a mutualistic relationship with Dysaphis plantaginea and the Aphis spp., but not with Eriosoma lanigerum. In a field survey, Dysaphis plantaginea performed better in the presence of ants, while no effect was observed in Aphis spp. However, in a manipulative experiment the opposite result was obtained: populations of Aphis spp. performed better in the presence of ants, while no differences were observed for Dysaphis plantaginea. Populations of Eriosoma lanigerum were reduced in the presence of ants. 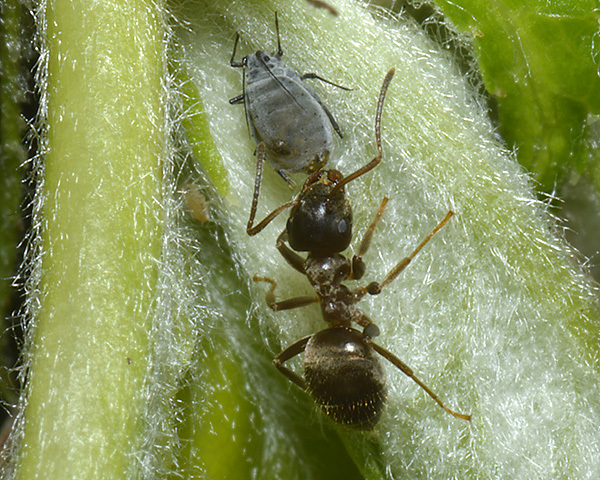 Ants also had a significant negative effect on the abundance of natural enemies, which could partially explain the benefits to tended aphids. However, while ants did not provide a benefit to Aphis spp. when it was reared alone, in the presence of other species ant attendance increased Aphis abundance by 256% and simultaneously reduced Eriosoma lanigerum abundance by 63%. Therefore, ants benefited Aphis by reducing competition with other aphid species, which involves a different mechanism, explaining the benefit of ant attendance. Considering all the aphid species together, ants had a net positive effect on aphid abundance, which was consequently considered harmful for the plant. Nagya et al. (2013) and Nagya et al. (2015) carried out two experiments manipulating the presence of the common black ant, Lasius niger), visiting colonies of Dysaphis plantaginea and Aphis pomi by ant-exclusion with sticky barriers, or ant-feeding with honey as an alternative sugar source. The exclusion of ants reduced both aphid populations in both experiments. Ant-feeding with honey reduced the numbers of ants tending Dysaphis plantaginea colonies, and it consequently reduced Dysaphis plantaginea populations in both experiments. The supplementary feeding of ants was more effective in reducing Dysaphis plantaginea than Aphis pomi. This was probably due to the greater intensity of ant attendance on Aphis pomi than on Dysaphis plantaginea colonies when both species were present together. This section details studies which identified predators and parasitoids occurring naturally in orchards. Active biological control, either by habitat manipulation or mass release, is covered further down. Pålsson et al. (2016) studied the natural enemies attacking Dysaphis plantaginea under different management regimes in a situation. Early stage rosy apple aphid colonies were established on potted trees in five organic and four conventional apple orchards in southern Sweden. Ant attendance was inhibited by means of sugar feeders, and natural enemies were excluded from some trees using a net sleeve (termed exclusion controls). There was a drastic reduction in numbers in exposed colonies compared to the exclusion controls in both conventional and organic apple orchards. Despite this reduction, differences in colony survival were still observed between conventional and organic apple orchards, with surviving colonies larger in conventional orchards than organic. The most recorded natural enemies within the established colonies were Anthocoris bugs, followed by predatory midges, earwigs, spiders and lacewing larvae. Few syrphid eggs and larvae were observed. There were strong differences in Anthocoridae and Miridae populations between management schemes, whilst no differences were observed for other important aphidophagous natural enemies. Anthocorid population size in the different orchards was correlated with the rate of Dysaphis plantaginea colony decline and, in organic orchards, there were more visits by predatory Heteroptera. 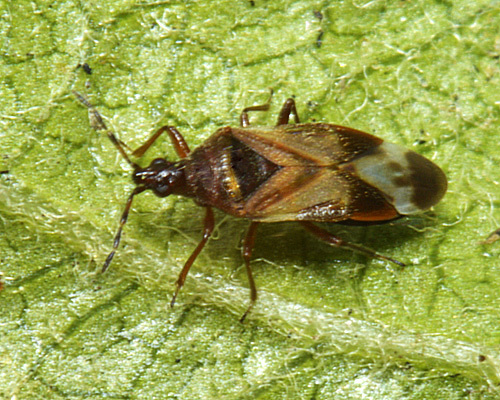 Their results suggested that predatory Heteroptera, in particular those of the family Anthocoridae, play an important role in the suppression of the rosy apple aphid at initial infestation phases in Nordic conditions. The use of pesticides appears to reduce their numbers and thus the biological control service they provide under an artificially reduced ant attendance. Dib et al. (2010) looked at the role of natural enemies in the population dynamics of the rosy apple aphid in organic apple orchards in south-eastern France. Their aim was to determine how the abundance and composition of arthropod communities associated with aphid colonies affected rosy apple aphid population dynamics. 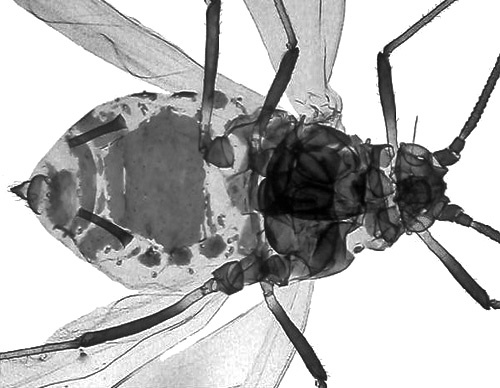 The larger rosy apple aphid populations per shoot observed in two of the five orchards were thought to be related to a lower number of natural enemies and high numbers of ants. Among the main natural enemy groups, syrphids arrived first, followed by coccinellids and earwigs. Parasitism rates, mainly due to braconid Ephedrus species were low. The syrphids appeared to be the most efficient predators. We have often found syrphid larvae predating Dysaphis plantaginea in Britain (see pictures below). Dib et al. 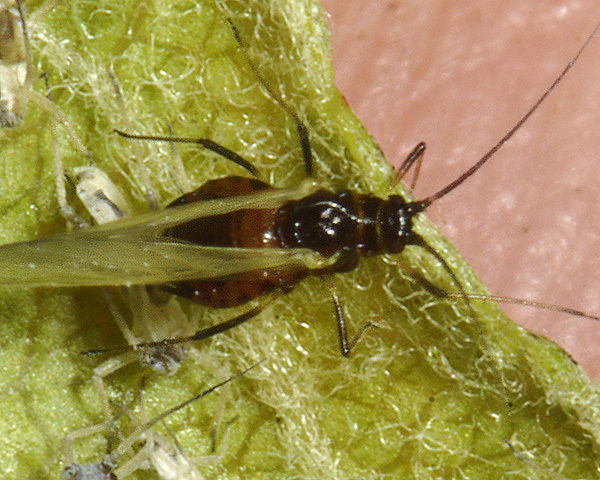 (2011) compared two predators of the rosy apple aphid: the generalist earwig Forficula auricularia and the specialist syrphid Episyrphus balteatus. Overall, the older life-stages of both predator species were more voracious than younger individuals. The two predator species did not negatively interact. Instead, when the aphid density was not limiting they had an additive effect. 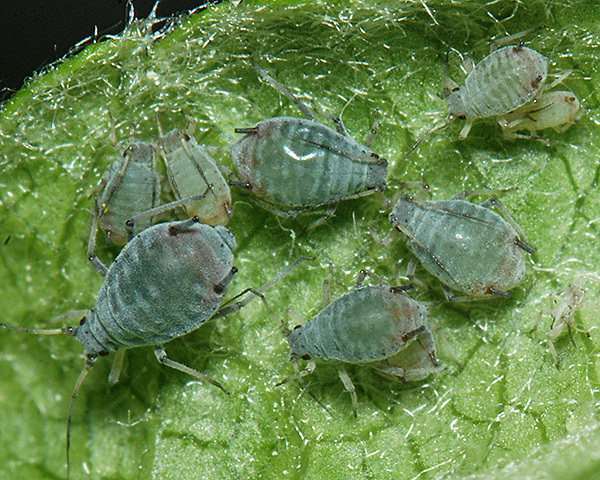 Although the predators consumed significantly higher numbers of aphids when the younger life-stages were offered, they fed more efficiently on the older life-stages of aphids with higher biomass consumed. 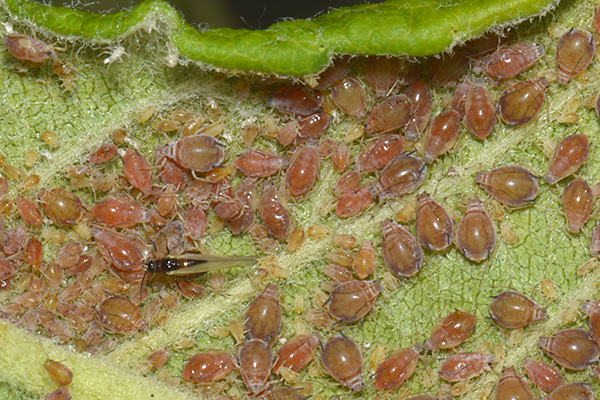 Overall, the two predators consumed a constant proportion of rosy apple aphid over four aphid densities until reaching satiation. 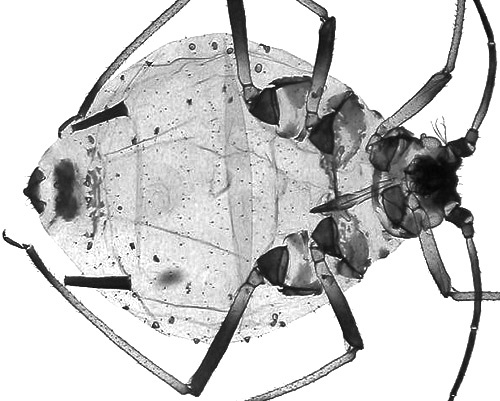 This finding suggests that, in theory, they would be effective in regulating rosy apple aphid numbers in early spring when field aphid populations are beginning to build up. Miñarro et al. (2005) looked at the colonization of apple orchards by predators of Dysaphis plantaginea. Larvae of the syrphid Episyrphus balteatus , the coccinellid Adalia bipunctata and the midge Aphidoletes aphidimyza were the three most abundant natural enemies of Dysaphis in Spanish apple orchards. They attack this aphid in sequence: the syrphid arrived first, followed by the coccinellid and then by the midge. The midge larvae arrived too late to have a regulating effect. 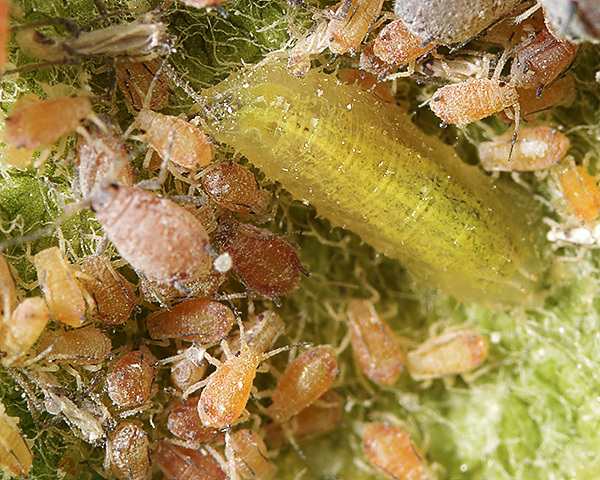 The aphid predators did not respond numerically to the abundance of the pest. The author felt that the study indicated that natural populations of syrphids and ladybird beetles are unable to control Dysaphis plantaginea, and therefore a more complex strategy than waiting for natural enemies is required. Boreau de Roincé et al. (2013) investigated whether early-season predation by canopy spiders may be effectively controlling aphid numbers in three organic orchards. They found that spiders ate colony fundatrices and that aphid numbers were negatively related to spider abundance. Spiders were the main active predators within the orchards when the first colony fundatrices were present, indicating their importance in the early control of aphid populations. Fungal pathogens seem relatively rare in rosy apple aphid colonies, and we have only recorded them once (see picture below). Barta (2009) recorded Entomophthora planchoniana from Dysaphis plantaginea in Slovakia. This pathogen has been found to maintain effective control of the pine aphid Eulachnus rileyi in plantations in Zimbabwe (Katerere, 1983). Dysaphis plantaginea has been recorded on 8 species of the Malus genus. 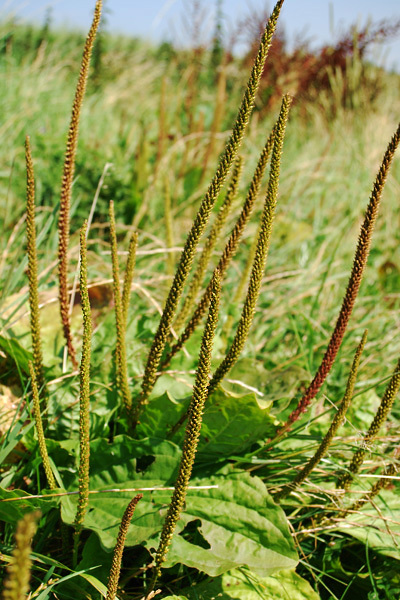 Dysaphis plantaginea has been recorded on 8 Plantago species. Blackman & Eastop list 22 species of aphid as feeding on great plantain (Plantago major) worldwide, and provide formal identification keys. Of those aphid species, Baker (2015) lists 17 as occurring in Britain: Aphis fabae, Aphis frangulae, Aphis gossypii, Aphis nasturtii, Aphis plantaginis, Aphis spiraecola, Aulacorthum solani, Brachycaudus helichrysi, Dysaphis aucupariae, Dysaphis plantaginea, Macrosiphum euphorbiae, Myzus ascalonicus, Myzus cymbalariae, Myzus ornatus, Myzus persicae, Neomyzus circumflexus and Smynthurodes betae. All commercially grown apples are considered susceptible in Britain (DEFRA/AHDB) but some, such as "Golden Delicious", are highly susceptible. Host plant resistance is considered an essential component of integrated management of this insect pest. Miñarro & Dapena (2007) tested the importance of flowering phenology in damage caused to apple cultivars by rosy apple aphid. Flowering order among cultivars was significantly negatively correlated with aphid infestation and damage in field, in other words, early-leafing cultivars showed higher infestation and damage than late-leafing cultivars. If egg hatching occurs before bud bursting, neonate larvae will suffer a high mortality because they cannot feed on these late cultivars. A later recolonization of these trees is hampered because (1) winged aphids cannot live on apple but only on the secondary host, (2) apterous forms have a limited dispersal capability, and (3) aphid predators progressively increase in the orchard. Therefore, synchronization between egg hatching and bud bursting is of critical importance in the success or failure of infestation. Razmjou et al. (2014) evaluated resistance in seven apple cultivars to rosy apple aphid under greenhouse and field conditions in Iran. The damage level by rosy apple aphid was significantly different among the tested cultivars precisely three weeks after infestation in both field and greenhouse conditions. The least leaf-curling was observed on the Shaki cultivar, while the most deformation was detected on Golden Delicious. There was a positive correlation between damage in greenhouse and field studies. In addition, the lowest and highest numbers of aphids were observed on Shaki and Golden Delicious, respectively. Their results demonstrated that, among the cultivars tested, the Shaki cultivar was moderately resistant to rosy apple aphid and had the potential to be used in the integrated management of this aphid. 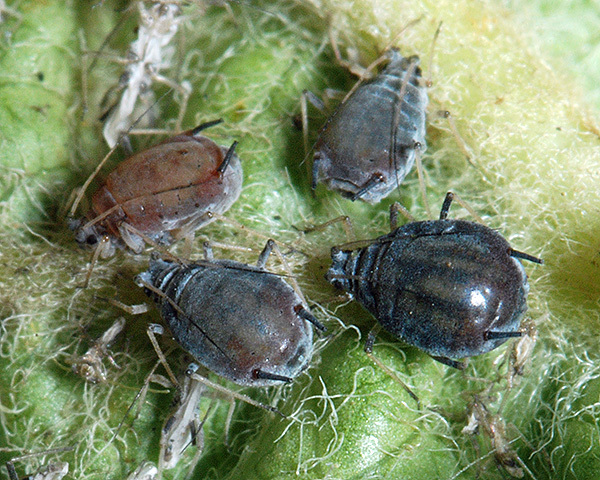 DEFRA/AHDB summarise current methods for chemical treatment of orchards for this pest. Pirimicarb is commonly used to control aphids in orchards . It is a selective carbamate that works by inhibiting acetylcholinesterase activity, but does not affect some of the useful predators such as ladybirds. Another newer selective insecticide is Flonicamid, a pyridincarboxamid that inhibits the feeding behaviour of aphids. It has been shown to provide good control of most of the important aphid species on apple. Two neoneonicotinoids are also effective against Dysaphis plantaginea, acetamiprid and thiacloprid. Acetamiprid is highly selective and is also effective against mussel scale (Lepidosaphes ulmi). Thiacloprid is active against a wide range of apple pests, but does have adverse effects on earwigs which are an important predator. Wyss and Daniel (2004) looked at the effects of pyrethrin treatments, and the repellent kaolin product Surround®, on autumn populations of Dysaphis plantaginea in apple orchards in Switzerland. Single and multiple applications of pyrethrin and kaolin were tested at different dates after apple harvesting in autumn 2002 when sexuales of the rosy apple aphid were present. Repeated applications of Surround in autumn significantly reduced the number of females in autumn and, consequently, the number of hatched fundatrices in spring. Single kaolin treatments were less effective. Unexpectedly, neither single nor multiple applications of the contact insecticide Pyrethrum FS had a knock-down effect on females in autumn. However, pyrethrin significantly reduced the number of hatched fundatrices in spring. Neither pesticide completely controlled the rosy apple aphid but with a more detailed analysis of factors influencing the efficacy of autumn treatments a new approach to control this serious pest could be achieved. Rosy apple aphid is normally controlled in commercial apple orchards by an application of an aphicide in the spring. Control is often inadequate, especially in organic production where the range of aphicides permitted, which are only contact acting, is very restricted. Cross et al. (2007) evaluated control of rosy apple aphid by autumn applications of aphicides. Their experiments showed that control of the aphid in the autumn with pirimicarb or pirimicarb + cypermethrin can be highly effective and, with 2-3 sprays of the organically permitted insecticide pyrethrum, moderately effective. The optimum time for spraying was early-mid October, coinciding with the start of migration of males and before mating and egg laying, as indicated by Rothamsted Insect Survey suction traps at 8 sites throughout England. Other organically acceptable materials tested including kaolin did not give useful control. The vulnerability of gynoparae and oviparae on the flat undersides of leaves (i.e. leaves not curled by aphid feeding) in the autumn where they can be directly intercepted with sprays, compared to the inaccessibility of fundatrices and their progeny enclosed in blossom clusters and leaves curled by aphid feeding in spring, was discussed. The authors highlighted the need to develop assessment methods and treatment thresholds for autumn treatment so routine spraying can be avoided. Wyss (1995) looked at the effects of weed strips on aphids and aphidophagous predators in an apple orchard in Switzerland. Selected weeds were used to attract predators such as anthocorid bugs. In the year before the experiment, Dysaphis plantaginea and Aphis pomi and aphidophagous predators were homogenously distributed in the orchard. Weed strips were sown between tree rows and along the border parallel to the first and the last row of trees in one part - the other part served as control. In both parts of the orchard, randomly chosen trees were monitored at weekly intervals in 1992 and 1993. During flowering of weeds more aphidophagous predators were observed on the apple trees within the strip-sown area than in the control area. The most abundant aphidophagous predators were spiders, predaceous Heteroptera, Coccinellidae, and Chrysopidae. Both species of aphids were significantly less abundant in the area with weed strips than in the control area during the period. Wyss (1996) attempted to enhance the biological control of apple aphids (predominantly Dysaphis plantaginea with lower numbers of Aphis pomi and Rhopalosiphum oxyacanthae) by planting strips of wild flowers with the intention of increasing the number of predators (syrphids, cecidomyiids, lacewings, earwigs and spiders). Unfortunately they had higher infestations of Dysaphis plantaginea in the flowering part of the orchard than in the grass strip part. Kehrli & Wyss (2001) assessed the impact of augmentative releases of indigenous predators and insecticide applications to control the autumn aphid forms of the genus Dysaphis. Eggs and larvae of the two-spot ladybird beetle (Adalia bipunctata were released on 4-year old apple trees in various numbers at five different dates in autumn when sexuales of the aphids were present. Additionally, pyrethrum was sprayed at the same five dates to compare the effectiveness of these augmentative releases to a commonly applied insecticide. Augmentative releases of larvae before mid-October significantly reduced the deposition of overwintering eggs by aphids and consequently reduced the number of hatched fundatrices in spring, 1999. There was a significant negative functional response among the number of released coccinellid larvae in autumn 1998 and the number of observed fundatrices on apple trees in spring 1999. Applications of pyrethrum before mid-October were more effective than augmentative releases of larvae of Adalia bipunctata. The release of coccinellid eggs had no impact on the number of fundatrices of the genusDysaphis in the next spring because they did not hatch due to bad weather conditions. The weather conditions in autumn seemed to have an impact on the autumn migration of the winged aphids back to their primary host. The authors felt prevention of egg deposition of aphids in autumn was a promising control strategy and deserveed further exploration for practical use. 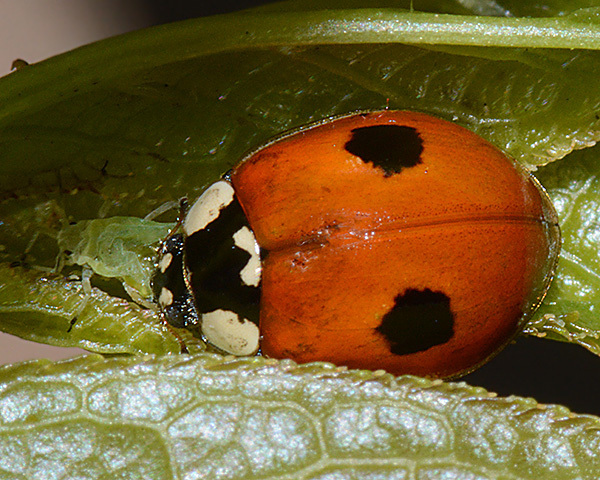 Wyss & Villiger (1999) assessed the impact of augmentative releases of larvae and eggs of the indigenous ladybird beetle Adalia bipunctata against the rosy apple aphid in field experiments in Switzerland. 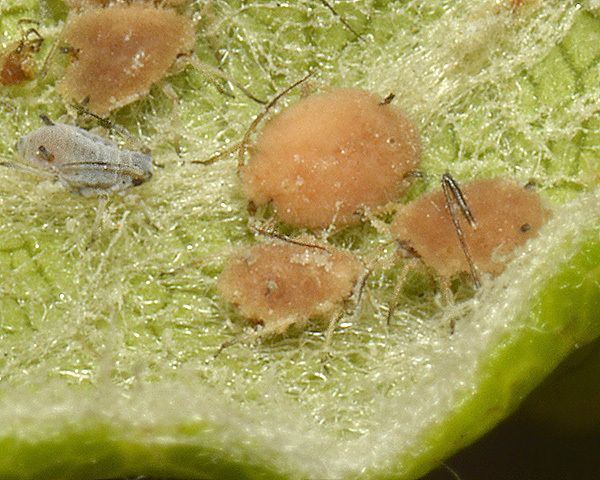 In a first experiment, eggs and larvae were released in apple trees infested with five aphids at four different predator-prey ratios. 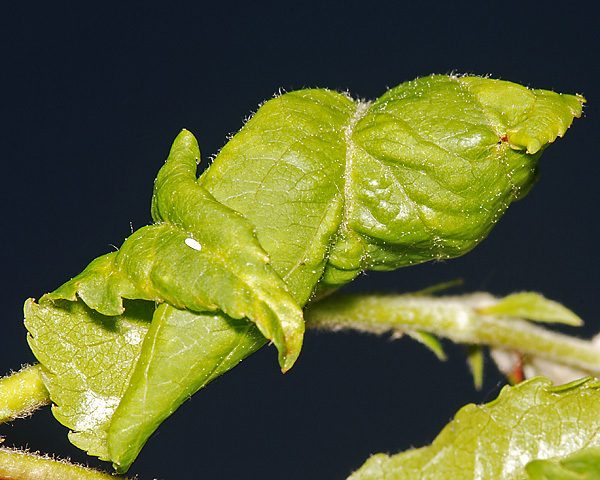 In a second experiment, eggs and larvae were released at a predator-prey ratio of 5:1 on branches of apple trees naturally infested with aphids. In both experiments, the interaction with ants was taken into account and the releases were done at two different times in spring. The results showed that an augmentative release of larvae significantly reduced the build-up of colonies of Dysaphis plantaginea. Significant reductions in aphid numbers were recorded at the two highest predator-prey ratios. Larvae were efficient just before flowering of apple trees at a time when growers normally have to spray their trees. Where ants were present the larvae of Adalia bipunctata were significantly less efficient. The effects of eggs of Adalia bipunctata were less reliable than larvae, and at the first date of release they did not hatch, probably as a consequence of bad weather conditions. Brown & Mathews (2007) examined the potential for enhancement through conservation biological control, in particular the effect of interplanting extrafloral nectar-bearing peach trees. By 20 days after first bloom, only 2% of fundatrices initially present survived to form colonies. Exclusion studies showed that many of the early colonies were probably destroyed by predation, the major predator responsible being adult coccinellids, Harmonia axyridis. Mortality before apple bloom was most important in controlling rosy apple aphid population growth but by itself is not sufficiently reliable to prevent economic injury. Interplanting of extrafloral nectar-bearing trees did not increase biological control, and interplanting with 50% trees with extrafloral nectar glands reduced biological control. The number of leaf curl colonies in the 50% interplanted orchards was lower than in monoculture orchards, suggesting a preference of alate oviparae for more diverse habitats, supporting the resource concentration hypothesis but not at a level sufficient to prevent injury. Predation and parasitism after the formation of leaf curl colonies was not adequate to control rosy apple aphid populations. Dib et al. (2016) used an exclusion system to evaluate the potential of early-season releases of the generalist predator European earwig (Forficula auricularia) for control of Dysaphis plantaginea in two pesticide-free apple orchards in Southeastern France. They successfully reared earwigs with a high survival rate of nymphs. There were three treatments in the study: (i) a "release treatment" where they confined the released earwigs in the canopy by using a barrier system; (ii) an "exclusion treatment" where they blocked free access of earwigs into the canopy using the same barrier system; and (iii) a "control treatment" that represented the natural situation. 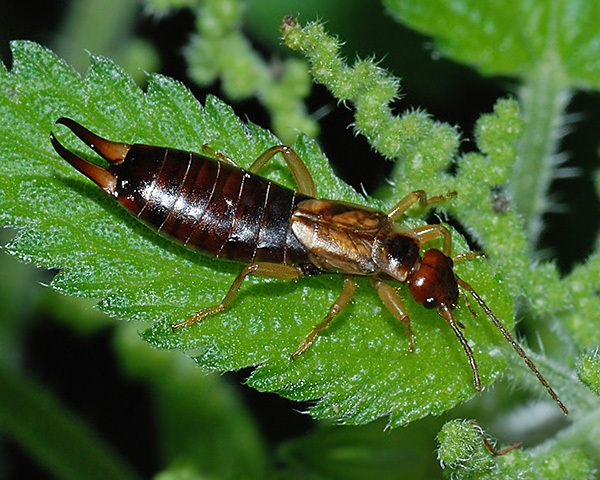 Contrary to expectations, earwig releases did not reduce Dysaphis plantaginea populations. In general, the abundance of natural enemies and their prey did not differ significantly among treatments, except for earwigs. They observed that the exclusion systems successfully kept both earwigs and ants away from tree canopies; total numbers on trees in the "exclusion treatment" were significantly lower than on the other two treatments. Due to the complexity and difficulty of evaluating augmentative releases of natural enemies in open orchard conditions, they concluded that new technical approaches to control site conditions are needed when conducting such studies. Bird et al. (2004) assessed the common black ant, Lasius niger, as a vector of the entomopathogen Lecanicillium longisporum to Dysaphis plantaginea. Lasius niger workers which were artificially contaminated with fungal conidia, carried them primarily on their tarsi but also on antennae and mandibles. 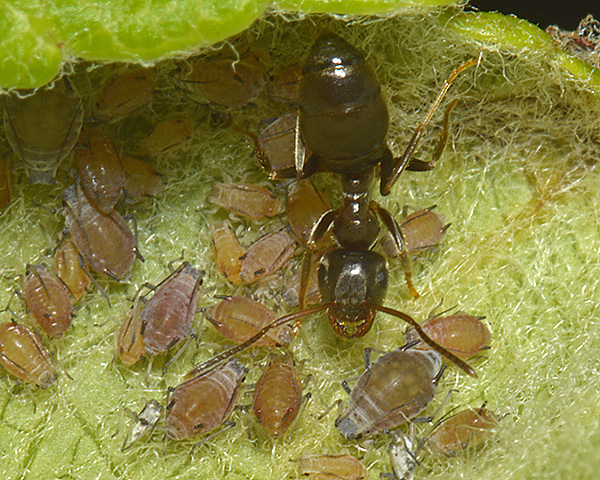 Neither Lasius niger workers nor larvae were susceptible to infection with the fungus. Workers which were artificially contaminated with conidia initiated infection in colonies of healthy Dysaphis plantaginea on apple. Mortality due to the pathogen was recorded as 68.3% and 30.8% of aphids under laboratory and semi-field conditions respectively, but only 3.7% under field conditions. Solomon et al. (2000) gave a rather pessimistic review of the potential for biological control of Dysaphis plantaginea with predators in northern and central Europe. Several groups of naturally occurring polyphagous predators, such as chrysopids, coccinellids, syrphids and spiders, prey on a Dysaphis plantaginea in orchards, contributing to the reduction in pest populations. However, they are unlikely by-themselves to prevent pest-damage fully and reliably. An exception, due to its abundance in orchards, is the common earwig, Forficula auricularia, although this predator may also cause some fruit injury. Another option to consider when reviewing possibilities for biological control in orchards is the introduction of biological control agents. The success rate of this approach, using arthropod predators to control pests of field crops, has been generally poor. Furthermore, mass production methods for predators are likely to be difficult and very costly. 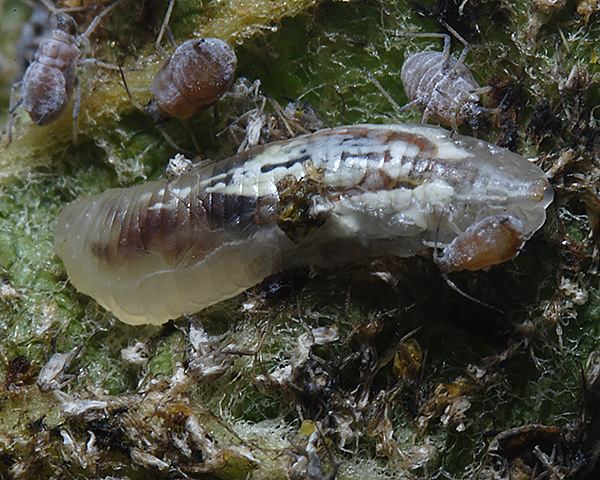 The biological supplies industry is constantly seeking culture techniques, largely for arthropod biological control agents of pests of protected crops. It is possible that some future advance may be relevant to orchards, though currently available predators do not appear promising. The authors suggested a careful economic appraisal of the feasibility of use of any potential biological control agent would be prudent before embarking on research. We especially thank Plumpton College Plumpton College at Stanmer Park for their kind assistance, and permission to sample.